Here is a great article about how adding a blog to your website can increase your visibility, endear you to customers and ultimately increase sales. 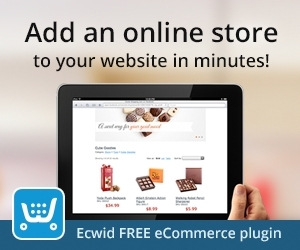 To add an online store to your website or facebook page go to Ecwid to get started today. Lawrie McConaghy is just about the nicest guy you’ll ever meet. He is also the Captain of Voyager Charters Remote Fishing. Lawrie and wife Joanne have “Voyager” a 55 foot Steel Charter Vessel, fully air conditioned and comfortably accommodated, she’s suitable for Extended Trips. They also have “Voy Toy” a 9 Meter Game Fishing Boat Available for Charter. Rounding out the fleet are 2 Polycraft boats. He has a new facebook page and website and would love your support! Vote for the Swiss Cake Shop to Win Best Dressed for Chinese New Year! Go to the website for Zinc FM Cairns to Vote the Swiss Cake shop to win the best dressed business on Grafton for Chinese New Year Celebrations! Here is a great article in Smashing Magazine that explains why you, the business owner / website owner are the best person to manage your SEO. If your goal is to improve your search ranking you will lose. If your goal is to make a rich experience for your users you will win. 4. Producing detailed case studies. 6. Creating useful applications or tools. 7. Running a Q&A section. Here are a trio of website I created for Colin Lawson. Owner of Extreme Motorcycles in Atherton. Colin owns the patent on “CV Savers” a unique CV Boot protection system for Quad Bikes that he invented. He and business partner Daryl “Bullet Knight” also started “Quad Safe Australia” and “Extreme Quad Adventures” from their love of Quad Bike Riding. These websites are custom made to the requirements of the owner. Every website I design is unique for that business. Just a quick announcement. Servers at Sydney Data Centres will receive an upgrade on March 22nd. Work will begin at approximately 10:00PM AEDT on March 22 and is scheduled to be completed by 5:00AM AEDT on March 23. This means your website and email will be unavailable during those hours. I sincerely apologise for any inconvenience this might cause. If you have any questions or concerns please contact me. “The most beautiful WordPress yet” is out. WordPress 3.8 code named “Parker”, affectionately named for Charlie Parker. Check it out. I’ll be having a play with the new 2014 magazine theme and have examples to show soon. “Your connection to this server has been blocked by the firewall. You will need to contact the owner of the website to have them unblock you. Then please contact me with your ip address and I will have your ip address unblocked right away. Why would your ip address be blocked? It’s for your protection really. ftp: Excessive invalid FTP login attempts. cpanel: Excessive invalid cPanel login attempts. pop3: Excessive invalid POP3 login attempts. imap: Excessive invalid IMAP login attempts. smtp auth Excessive invalid SMTP login attempts. mod_security: This occurs when you are attempting to view a page via an invalid URL. htpasswd :Excessive invalid htaccess login prompt attempts. A few months ago my wife, local designer Sajeela Jamie volunteered her time and created a dress to auction for a charity fundraiser organised by philanthropist Dr. Alia Kassam for “The Bosco Adams Project”. The Bosco-Adams Project was started by the Adams Family in Melbourne, Australia with the express purpose of helping to feed, clothe and educate at least 50 children at an orphanage in Bangalore. I recently had the pleasure of creating their new website. I am pleased that they selected me for this project. It is one of the benefits of my position that I do get to consider, at my leisure, the amazings works both in art and life of the many people I create websites for. Check out their website and facebook page for more information on how you can help this very worthy cause.